We were finally able to submit our plans to the Swartland Municipality for approval. If you read our previous article on our first attempt, you will know that this only means that our plans passed the scrutiny process. We still have to wait for the final approval before we can begin building. 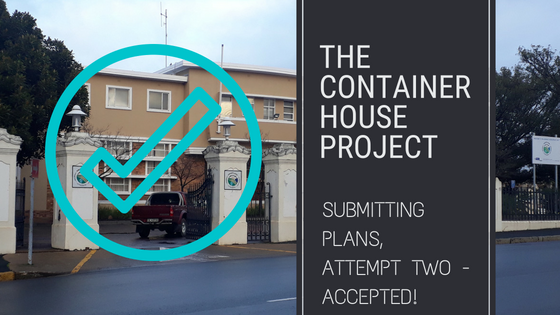 The plans submission process has been quite a steep learning curve for us, but this is an exciting moment because it means our house is one step closer to completion! It’s strange to think that a thick pile of paperwork dictating the future of our plot is sitting in an office in the building featured in the photo above. Thursday morning found Kevin and myself in an excellent mood as we drove through to Malmesbury for our appointment with Mr Burger. We were right on time. As per our previous visit, we were ushered into his office. A quick look at the drawings from his side had the majority of them okayed in a few minutes. However, one drawing still had a couple of small details that needed to be revised. So, very disappointed we left the office. We discussed several options on how best to go about resolving the issue on the last drawing, while running another quick errand. This gave us a bit of time to think about the situation and our way forward. Half an hour later we decided to see if our architect, Aubrey Philander, was available to meet up with us to discuss the drawing in question. He agreed to meet with us on very short notice – i.e. the amount of time it took us to drive through to him in Ceres (approximately an hour from Malmesbury). Aubrey Philander was kind enough to sort out the problem then and there and within half an hour we were back on the roads returning to Malmesbury. Racing around the countryside after paperwork is hungry work. We stopped in Riebeek Kasteel for a toasted sandwich, and arrived back in Malmesbury at midday. We were very glad we had made such good time. There was a possibility we’d be able to sneak in another quick appointment with Mr Burger. After stopping at a local internet cafe to print out another supporting document, we went straight to the Swartland Municipality. We got there just as the department’s lunch time was ending. Mr Burger had five minutes to spare and graciously let us try again at our plans submission. No, I’m not feeling at all impatient. Why do you ask? This time, we passed the scrutiny! Before I knew it, I was climbing up the flight of stairs to the next floor to submit the plans and find out what fees we would need to pay. The fees are worked out according to the square meterage of the proposed building. The last stop was the cashier on the ground floor to obtain the bank details and get a payment reference for the bank transfer. Now we wait. We should have a response from the municipality on final approval on our plans submission in about three weeks. If the plans are approved, we will finally be legally allowed to begin the project. Many, (if not all) architects will submit the plans on your behalf, but due to the nature of the project (budget) and this blog (educational purposes), we opted to do this ourselves.